Use only 1/4 cup brown sugar. 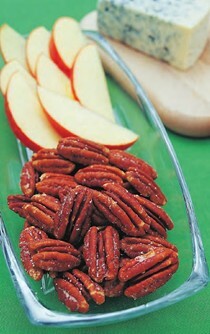 It's awfully hard not to love party nuts. Whether salty or sweet, spicy or mild, they are addictively delicious, the perfect nibble food for cocktail parties, holiday buffets, and any formal or informal gathering. 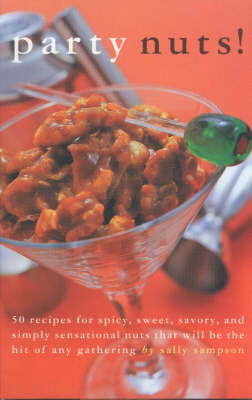 In Party Nuts!, veteran author Sally Sampson presents 50 recipes for all sorts of flavored nuts that will please every palate, along with easy, fun tips for serving them. There are sweet varieties (Toffee Pecans, Orange-Cinnamon Macadamia Nuts), mixes that will set tongues tingling (Spicy Killer Peanuts, Chipotle-Glazed Almonds), savory versions (Gingered Walnuts, Curried Cashews), and much more. Sally Sampson is a food journalist whose work has appeared in Bon Appétit, Food & Wine, the Boston Globe, and other publications, and she is currently a senior writer for Cook's Illustrated. She is the author of three books, including The Bake Sale Cookbook, and the co-author of five cookbooks, including The Olives Table, with Todd English. Sampson distributes her spiced nuts to specialty stores around Boston, where she lives with her husband and two children.